Extremely cheap low-speed PC/USB oscilloscope with STM32 (STM32F042) microcontroller. 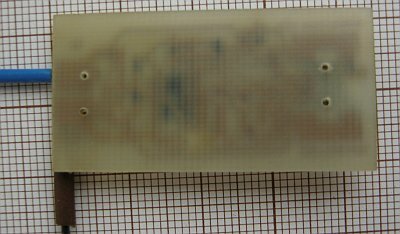 low component count: MCU, voltage regulator, mini-USB and few passive SMD components on single-sided PCB. 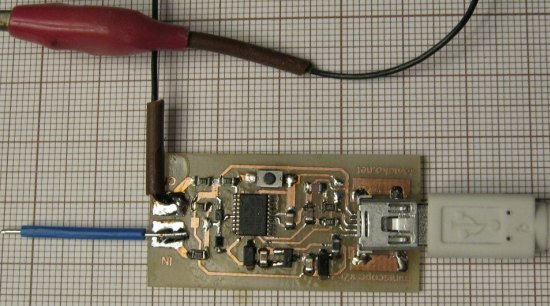 Announced in January 2014 Cortex-M0 microcontroller family that features crystal-less USB FS device allows to cut noticeable part of BOM when building oscilloscope/recorder similar to miniscope v2c/v2d. STM32F042F devices are interesting in particular because of small and friendly TSSOP20 package with minimum number or power lines. STM32F042F4 devices feature USB bootloader (DFU), single 1MSps ADC (so single channel sampling would be preferred to avoid crosstalk issues), 16 kB FLASH memory (~2 times more than needed) and 6 kB RAM. 1k5 USB pull-up should not be mounted as STM32F042 has internal pull-up - apparently used by ROM DFU bootloader also. Version from 2015.02.20 is intended to use R8 27k and R4 51k for input divider. Either 3V (that is one I've actually used) or 3.3V voltage regulator can be used. Comparing this schematic with Discovery kit for STM32F072 indicates that few other passive components (RC at USB D+/D-) may be redundant. 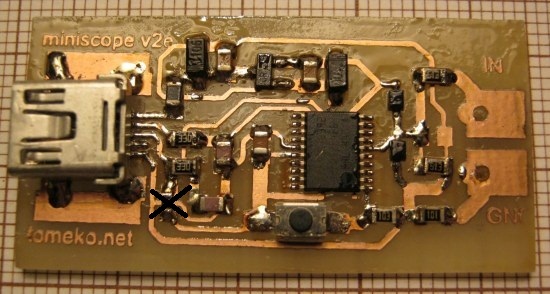 If you do not plan to experiment with firmware heavily (or don't mind some hanging wires at the time) you can replace SMD microswitch with some sort of jumper as it is needed only for firmware upgrading. Current version: miniscope_v2e_eagle_20150113.zip. SMD only. Intended to be wrapped in transparent heat-shrink tube with needle probe soldered to input. Interesting fact: only STM32F042, 100nF capacitors (buying few hundreds is cheap and they won't waste) and MCP1700 (thanks to Microchip for their sample program, but they are also quite reasonably priced - $0.35 ea from local retailer) are new parts in this unit, all others are reused - mini USB and microswitch come from mp3 player and all else (SMD choke, 10u electrolytic capacitors, Schottky diodes, two 0805 47pF capacitors and 0805 resistors) from old CD-ROM. Disclaimer: no working or worth fixing device suffered. From practical testing - for this probe type form thin USB cable without ferrite EMI filter at mini-USB side would be recommended for convenience. Plastic SD card box may serve as a case, although it is almost twice as large as my PCB. Initial release (for reference only, use updated version!). 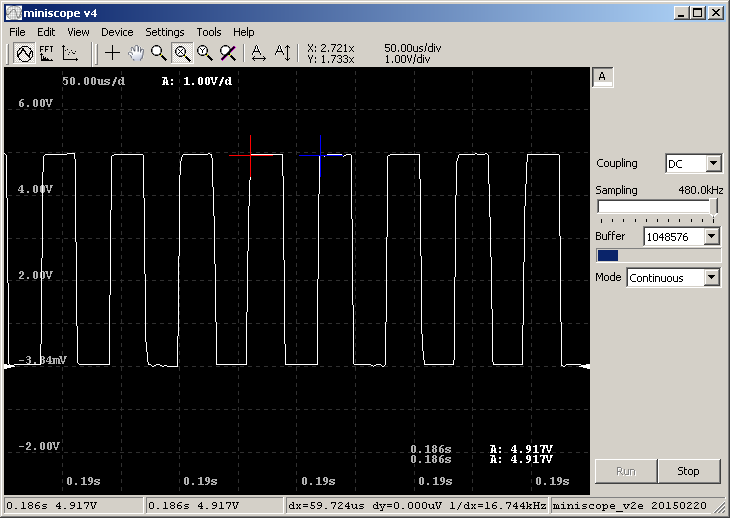 ADC configuration used: 8bit resolution (9.5 cycles for SAR), 13.5 cycles sampling time, 12MHz ADC clock. Resulting sampling speed = 12M/(13.5+9.5) = 521.7k [Sps]. Note: DLL is configured for 6V range (my board is actually using 3V voltage regulator). For 6.6V range (when using 3.3V voltage regulator and 1:2 divider) either rebuild DLL or use miniscope v4 calibration feature - 10% difference is allowed as calibration setting. All-in-one package (GUI, firmware, DLL, windows driver): miniscope_v2e_20150220.7z. Miniscope v2e is very similar to v2d as both STM32F0x2 and STM32F3 use USB DFU bootloader embedded in ROM. To enter bootloader mode detach power supply/interface (USB), press microswitch and while holding it attach USB again. You should see new device notification and DFU device would appear in device manager. Use STM DFUse demo or equivalent application to upload miniscope_v2e.dfu image to device. Right after upload finishes new device would appear. Miniscope v2e firmware is based on CDC example and so far I was too lazy to modify USB descriptors and debug it afterwards, thus it enumerates as composite device. Interface 01 is the one that handles bulk transfers and appropriate driver (libusb) is included in DLL archive. Once driver is installed device would appear under libusb-win32 group in device manager. Interface 00 (remains of CDC control interface) is unused and will be left without driver. Same as with miniscope v2c or v2d main application is a separate download - miniscope v4. After extracting it copy miniscope_v2e.dll into /device subdirectory. Start miniscope v4 and select this DLL at startup dialog. ADC input of STM32F0 in continuous behaves behaves like weak voltage source: there is low voltage (~220mV) present on oscillocope input even if it is disconnected; I'm hoping for possible explanation and/or workaround from STM forum. Firmware from 2015.02.20 assumes that input divider has 51k+27k resistors, giving 8.6V measurement range at 3V supply. With this divider described problem is neglectable - input offset is equal to ~3 ADC units.